Our chapter is so very grateful for our past, present and future patriots. We annually present awards to three local JROTC units in Manatee County. We provide entertainment for residents at the Douglas T. Jacobson State Veterans Home. 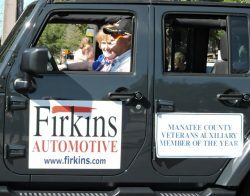 Chapter members are actively involved in the support of the Manatee County Veterans Council. 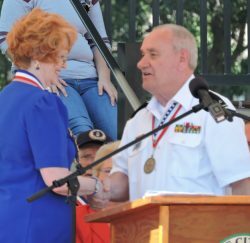 The chapter participates each year in the Veterans Day Parade, local commemorative events, and parades promoting patriotism. We collect stamps used as physical therapy tools for wounded veterans. We purchased wreaths for the Sarasota National Cemetery supporting the Wreaths Across America. Our chapter provides items to Manasota Operation Troop Support which assist local military families along with troops overseas. We generously support the efforts of the National Society’s DAR Project Patriot Committee. 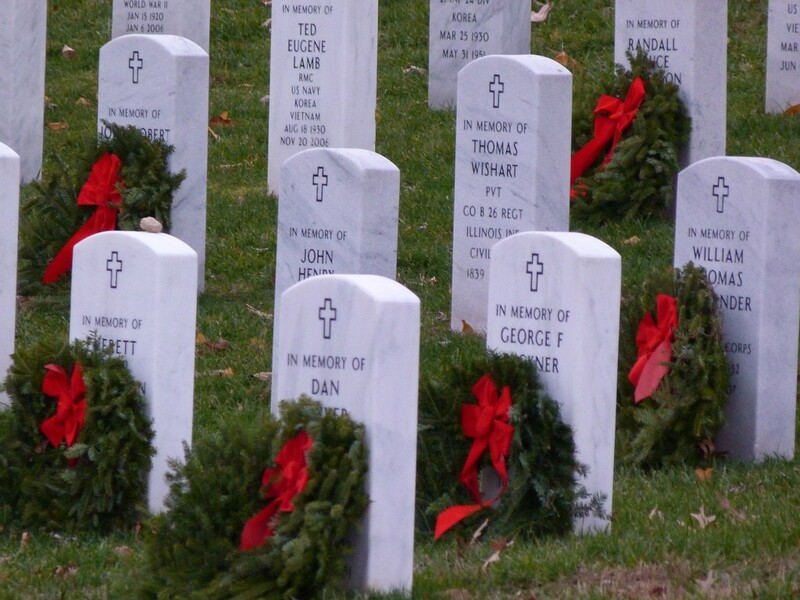 The Commemorative Partner Program is designed for federal, state and local communities, veterans’ organizations and other nongovernmental organizations to assist a grateful nation in thanking and honoring our Vietnam veterans and their families. 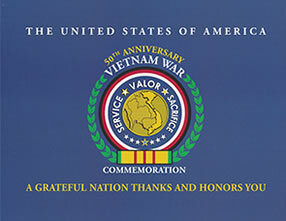 Commemorative Partners are encouraged to participate in the Commemoration of the Vietnam War by planning and conducting events and activities that will recognize the Vietnam veterans and their families’ service, valor, and sacrifice. Manatee Chapter thanked 40 Vietnam veterans for their service, sacrifice and valor at the Bradenton Senior Softball Banquet on Friday March 6th, as a part of the 50th Anniversary of the Vietnam War Commemoration. 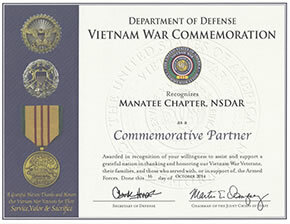 Manatee Chapter is proud to be a Commemorative Partner and to have the chance to honor our nations Vietnam veterans. 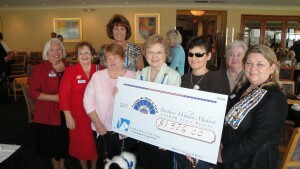 Pictured with the recipients is Sharon L Spry, Regent, Manatee Chapter, NSDAR. The event was held on Friday, November 20, 2015 at the River Clubhouse as a part the monthly pancake breakfast. Over 120 attended the event including: John Amelung, Gene Back, Jerry Bodalski, Jack Chambers, Gene Garrison, Dave Germann, Jerry Gilmore, Lloyd Graft, Gary Hartzler, Ron Hyland, Burt Jackson, Larry Jackson, John Lingle, Don Maxim, Carl Morgan, Terry Neubaum, Arnold Nilson, Don Olschefskie, Nick Osier, Roland R Pelletier, Gary Richardson, Marcia Rihm, Philip Rihm, Mark Schafer, Mike Solomita, John Wallace, Robert Seely, Ron Schneider. The December 28 ceremony took place at the Manatee Encore RV Resort in Bradenton. It was the chapter’s third such event this year and was held as part of an NSDAR initiative marking the 50th anniversary of the start of U.S. combat operations in Vietnam. Pictured left to right (front) are Sally Timm (Manatee Chapter), Timothy Maloney, Mike Maloney, Marc Reardon, Allen Makela, Kevin Falls, John Curvey, (row 2) Jim Townsend, Gwen Makela, Patricia Applebee, Kelly Kerns, (row 3) Clifford Mapes, Meg Smelser (Manatee Chapter), Gary Pontius, Richard Rasmussen, Robin Knuutila, Tom Bray, Sharon Spry (Regent, Manatee Chapter), Michael Catella, Robert Cox, Robert Ernst, (rear) Darrell Sears, Robert Hayes, Robert Novak, Ralph Garner, and Tom Proffer. Not shown: William Bacon, Vincent Bruck, Ernest Chapman, Dave Diener, Harry Knowles, Stephen Larson, David Martin, Ian Pelham, and Robert Phippen. Manatee Daughters honor another Vietnam Veteran at our recent meeting! for Manatee and Sarasota County troops and their families, during and after deployment. 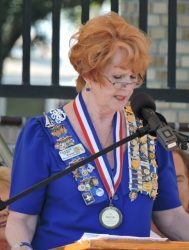 The Manatee Chapter, National Society Daughters of the American Revolution (NSDAR) made a surprise presentation during a recent Manatee County Veterans Council meeting. 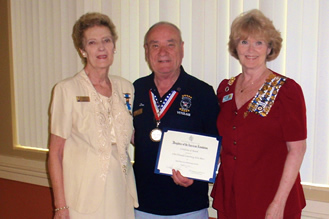 Manatee Chapter regent, Sharon Spry and chapter chaplain, Carol Saggau presented Don Courtney, Chairman of the Manatee County Veterans Council, with a Community Service Award. As chairman of the Manatee County Veterans Council, Don is responsible for leading this coalition of independent veterans organizations to foster fraternal relations amongst all veterans, create and maintain a greater public awareness and interest in veterans service to the community, to provide a forum for the identification and discussion of issues and actions that impact veterans and their families and to inform veterans/families on matters affecting veterans. As stated by Regent Spry, “The National Society, Daughters of the American Revolution, encourages us to recognize those individuals who have made an outstanding contribution to the community. For Manatee Chapter, this was a no brainer! ”Several letters of recommendation were written in support of this award. Larry Bustle, County Commissioner stated “Manatee County citizens, and especially Manatee County veterans, owe Don Courtney a large debt of gratitude for his community involvement and his successful efforts to make Manatee County a better place for all and a community that is proud of the sacrifices of its veterans.” W. Brad Steube, Sheriff wrote, “I believe that Mr. Courtney’s record proves him to be an outstanding citizen and I hope you will find him worthy of an award from the Daughters of the American Revolution”. Our chapter supported “Paws for Patriots” through Southeast Guide Dogs, Inc. We raised funds in support of “Paws for Patriots” our State Regent’s project in 2012. The DAR Insignia is the property of, and is copyrighted by, the National Society of the Daughters of the American Revolution. Web hyperlinks to non-DAR sites are not the responsibility of the NSDAR, the state organizations, or individual DAR chapters.